Newegg.com has a Rosewill USB 3.0 4 port Hub Sale, $0.00 after $10 mail in rebate, Free Shipping. Expires 11/16/2017 - Rated 4 out of 5 stars. Connect 4 more high speed devices (smartphone, tablet, drive etc) to your existing USB 3.0 port. Great for notebook or Ultrabook. 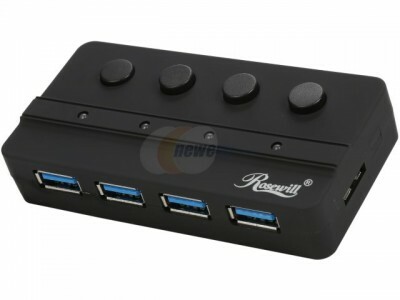 The USB 3.0 interface, backwards compatible with USB, Four individual on/off buttons, with corresponding LED indicators, make it easy to power down connected devices that are not needed, to save power and extend the lifespan.